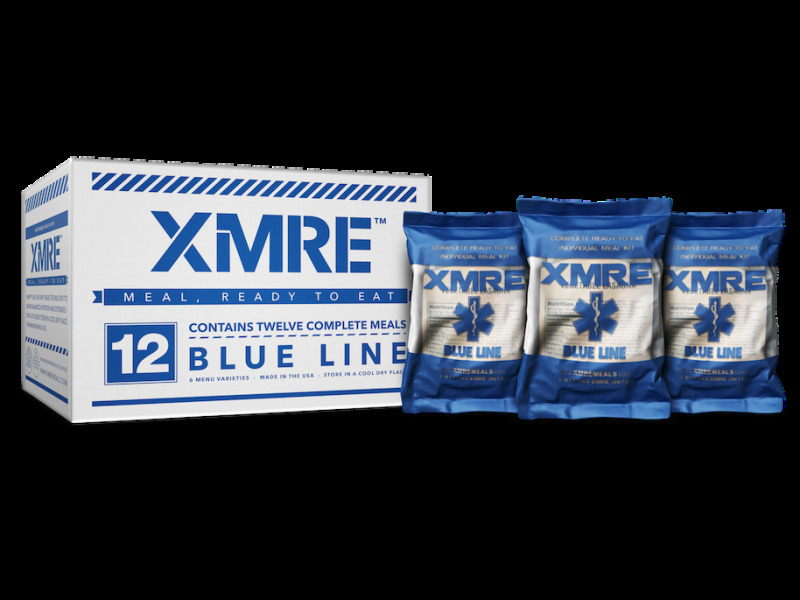 The XMRE Blue Line provides 1,000 to 1,200 calories of high quality shelf stable components per meal. All components are fully cooked so they can be eaten right out of the pouch. 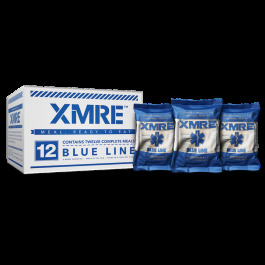 The XMRE Blue line has been specifically engineered to meet the critical requirements of government institutions, medical facilities, educational institutions, municipal entities, public service entities, and emergency preparedness programs. 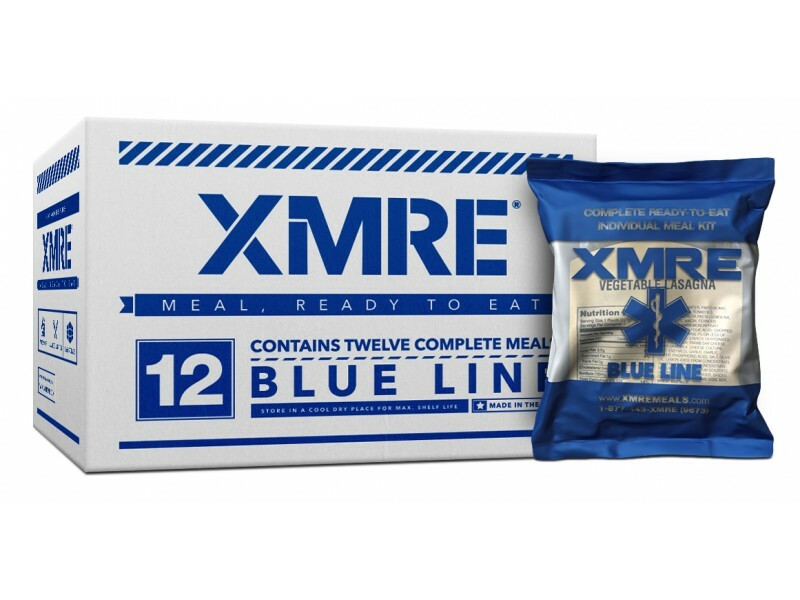 Each XMRE Blue Line case contains: 12 Complete ready to eat meals with flameless ration heaters. 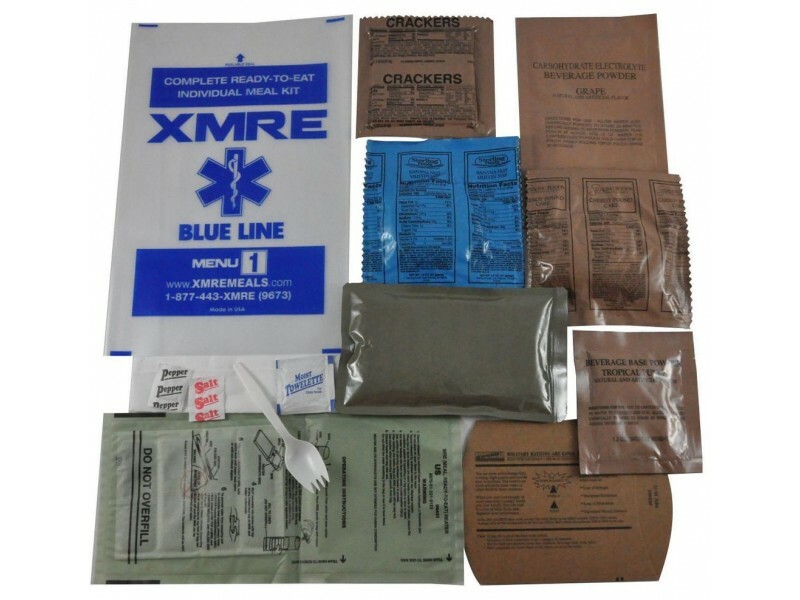 Entrée, bread item, spread/snack/side, dessert, beverage and an accessory kit including spoon, napkin, condiment kit and moist towelette and a flameless ration heater (FRH). All components are packed in high-density water and tamper proof XMRE Blue Line outer bag and embossed with a lot number (pack date) on each bag and case to ensure freshness. 12 Meals with heaters , 6 menus per case. ⦁ Entrée: Variety of beef, chicken, pork or vegetarian options. ⦁ Bread Item: Crackers, breads or tortillas. ⦁ Snack: Nut raisin mix, dry fruit mix, corn nuggets or others. ⦁ Side: Wet packed fruit, side dishes, bars or others. ⦁ Dessert: Puddings, pound cakes, brownies, dessert cookies or others. ⦁ Beverage: Single or assorted fruit flavored drink mixes or others available. ⦁ Accessory Kit Includes: Spoon, napkin, salt, pepper and moist towelette. ⦁ Lot number (pack date) embossed on bag and printed on case to ensure freshness. ⦁ Lightweight, durable and waterproof packaging. ⦁ Fully cooked meals, no water required to reconstitute food. ⦁ Flameless Ration Heater is included in each meal.